Welcome to the end of accounting accruals, PTO, sick time, and vacation request forms. Doesn't this already sound easier? Flexible or unlimited time off policies allow employees to take as much vacation time as they need, provided that they continue to deliver results. It’s a policy that focuses on the outcome rather than simply making sure that people come to work every day. According to the Society of Human Resource Management, approximately 1% of companies in the US have unlimited vacation policies, which include Ask.com, Eventbright, Evernote, Glassdoor, Groupon, Netflix, SurveyMoney, Virgin Group and Zynga. All of these companies have one thing in common: a belief that their employees are responsible enough to manage their time and complete their work. If executed correctly, an unlimited vacation policy is a free and easy way to boost productivity and entice new employees to come aboard. Richard Branson accurately described this new policy when he said: “Flexible working has revolutionized how, where and when we all do our jobs. So if working nine to five no longer applies, then why should strict annual leave (vacation) policies?” In effect, an unlimited vacation policy simply reflects the reality of the world we live in today. It seems that many companies maintain vacation policies that reflect the “industrial-manufacturing” period of time, in which vacation days slowly appeared as a reward for the harsh unpleasantness of assembly-line labor. In today’s high performance environment, however, when employees often check their emails around the clock (even while they’re on vacation), there is no such thing as a traditional eight-hour workday. Companies should realize that the employees of the industrial age have changed and need to be treated like mature, responsible adults. Studies have shown that a 10% increase in trust equals a 40% increase in pay. Thus it seems that employees today truly value trust, and this is what will increase productivity and employee satisfaction. So how does an unlimited vacation time benefit everyone? The biggest factor in unlimited vacation time is focus. With unlimited vacation, employees’ focus shifts from planning and/or worrying about having enough vacation days to meeting deadlines and accomplishing goals. Everyone needs the ability to spend time with family and friends, exercise, relax, etc. With a two-week vacation policy, employees are often afraid to use them for something fun in the event that something unexpected happens. Employees with children, for instance, will almost certainly have unexpected events occur throughout the year. This could be an unexpected illness, a field trip, or any other unplanned family-related event or emergency. Sometimes things just happen, and two weeks a year isn’t enough time. An unlimited vacation policy takes the pressure away. If something happens, employees know that they can focus on whatever the problem is without having the additional stress of losing pay. The correct amount of days necessary for individual employees will vary from person to person, year to year, and a flexible vacation policy allows a company to accommodate each employee’s needs without affecting productivity. Another huge factor is trust. As mentioned earlier, trust is a tremendous component to employee productivity. If you’ve hired the right people and effectively communicated your expectations as far as the quality of work that is expected and employee performance, you should be able to trust that your employees will be able to manage their time. It’s actually more likely that employees will take less time off than they would otherwise because they will feel more valued, and in turn, will feel more responsibility to the company and its success. While some consider happiness relative and fleeting at best, it needs to be considered as a key component to employee satisfaction. With respect to productivity and company growth some argue it is in fact a critical component. 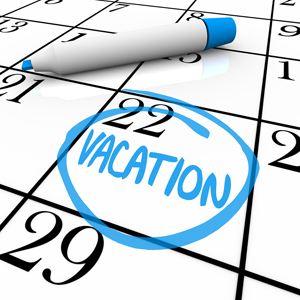 Unlimited vacation days create a greater sense of happiness, and as a result, a desire to work harder. Again, it comes down to selecting the right employees from the start. If you’ve created a company culture in which employees value themselves, others and the company as a whole, they will want to act in the best interests of their colleagues and the company. Because of this, employees will plan their vacations and make sure to prepare everything prior to their departure so their work doesn’t become someone else’s responsibility. In effect, an unlimited vacation policy creates happier employees who like coming to work and truly want to do what’s best for the company in the long run. Bottom Line: Creating a culture of trustworthy employees who value their job and the company, while maintaining a high quality of life outside of work is simply a win-win. Incorporating an unlimited vacation policy might accomplish just that.